This show is nostalgic of late 70s to early 80s type sitcoms. Think “Three’s Company”, “The Facts of Life,” “Different Strokes.” The show’s cast is a combo of human actors with puppets whom, in “The Happytime Murders” world are NOT operated by humans, they walk, talk, move, think on their own, have feelings, and are mortal. Also, their physical makeup causes a rare need for sugar. In society, they are looked at as an inferior speicies, and looked-down upon by humans. Displayed with a shot of a puppet geting a cab ride stolen from a human. The movie doesn’t waste any time with getting-down to the heart of the story after quickly establishing characters. The hero in this story is former LAPD officer Phil Philips, who is a puppet, turned to Private Investigator after getting expelled from the LAPD under circumstances surrounding his former partner, Detective Connie Edwards (played by Melissa McCarthy). Philips connection to “The Happytime Gang” that his brother played “Mr. Shananigans” on the show, AND he is hired by a mysterious vixen being threatened by the possible killer, throws him into a whirlwind of local murders of each cast member from the gang one-by-one and rather quickly. His investigation pits him directly back with his old partner, Edwards (Melissa McCarthy), where the history between the two unfolds throughout the movie. They are still bitter rivals when the two are forced to work together on the first of many Happytime Gang murders where they are out to find the killer. Philips ultimately realizes he’s admist a set-up and must prove himself to get out of the tangled web of decite. The ultimate M.O. comes after their visit of the Manager of the puppet cast from the show where their discovery of a shady contract clause sets them in motion to find the guilty person or puppet. The pot of gold is too tastey for someone who is out to get each cast member. Hopefully not before Philips and Edwards can get to them first. The film also showcases homage films such as “La La Land”, and “Basic Instinct” with takes of their own memorable, but recognizable scenes. 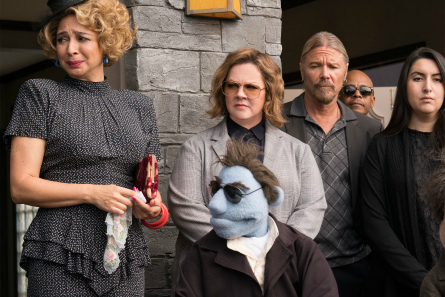 The human cast in “The Happytime Murders” movie are some real comedy heavyweights that include: Elizabeth Banks as a former ‘Happytime Gang actor turned stripper, Maya Rudolph who plays Philips’ secretary, Joel McHale whose FBI character steals each scene he appears in. Starring Melissa McCarthy, whom after her SNL (Saturday Night Live) stints, I was expecting more over-the-top funny from her character. There were plenty of opportunities that could have been written-in. But, just didn’t happen. Melissa McCarthey is a real-life hero! 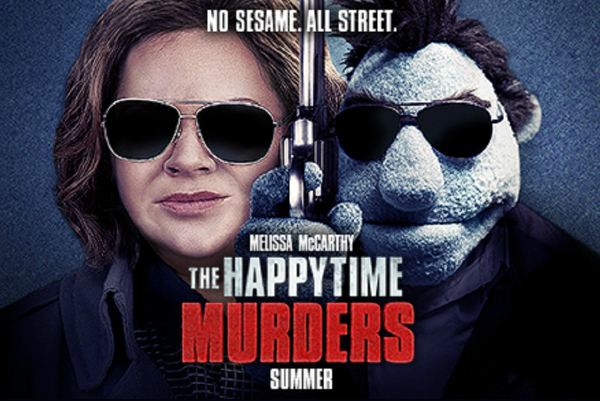 Hollywood Junket heard from multiple sources while filming “The Happytime Murders” who witnessed one of the puppeteers have a car accident on the set. The car crashed and the puppeteer was trapped inside the car. Aparently, witnesses said that Melissa McCarthey dropped everything and ran to the rescue of the puppeteer, pulling him out of the firy vehicle. Kudos to McCarthy! 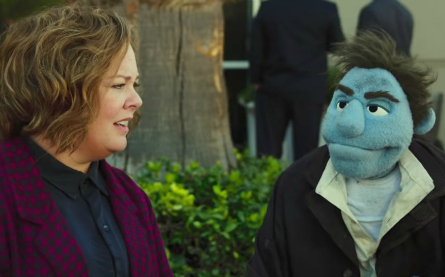 “The Happytime Murders” opens in theaters on Friday, August 24th.